Food isn’t necessarily the first thing that comes to mind upon the mention of Ireland and even if you do think of traditional Irish food, it usually comes to mind only after images of lush green countryside, James Joyce and perhaps even Guinness. As vegans, however, food is one of the first things we consider when visiting any country. Consequently, we discovered that Guinness is not vegan as fish bladder is used in their ale [there have been reports that this may be changing soon], so instead of adding the Guinness tour, Ireland’s number one tourist attraction, to our itinerary, we opted for the Jameson whiskey distillery tour when visiting Dublin. And so we loaded up our suitcase with a healthy amount of Cliff Bars and part of me was actually hoping for difficulty in finding vegan options because, frankly, I needed to lose weight. No such luck, however. It turns out that being vegan had become much easier in comparison to my trip there only 12 years prior. 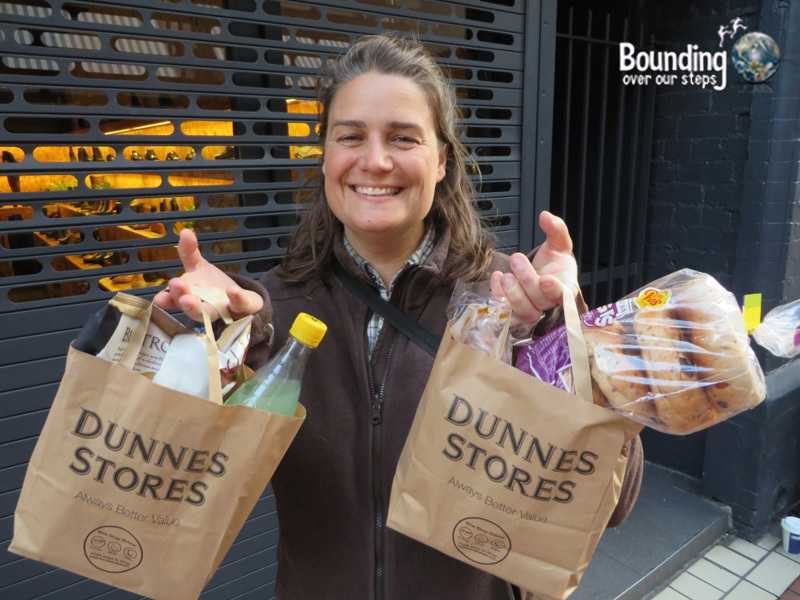 We were amazed to find soy and almond milk virtually everywhere in Ireland and not only in the bigger stores like Tesco and Dunnes. 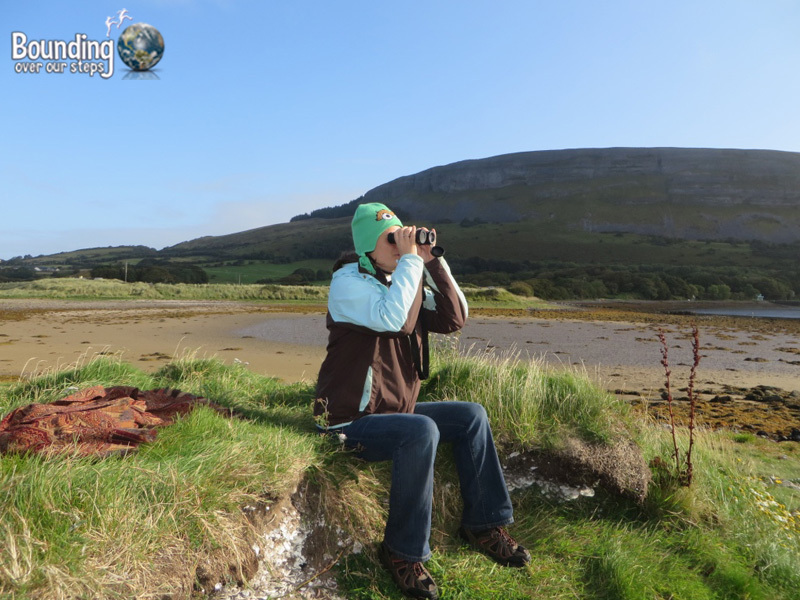 We found both soy and almond milk in rural areas of Connemara as well as the grocery store in the village of Strandhill of County Sligo. This small grocery also had a small variety of fruit and vegetables as well as egg-free pastas, cans of beans and sauces suitable for vegans. Other vegan products such as yoghurt and cheese were not as easy to come by in the more rual parts of Ireland, but in the bigger stores in Dublin, for example, we were able to find vegan yoghurt and vegan cheese. 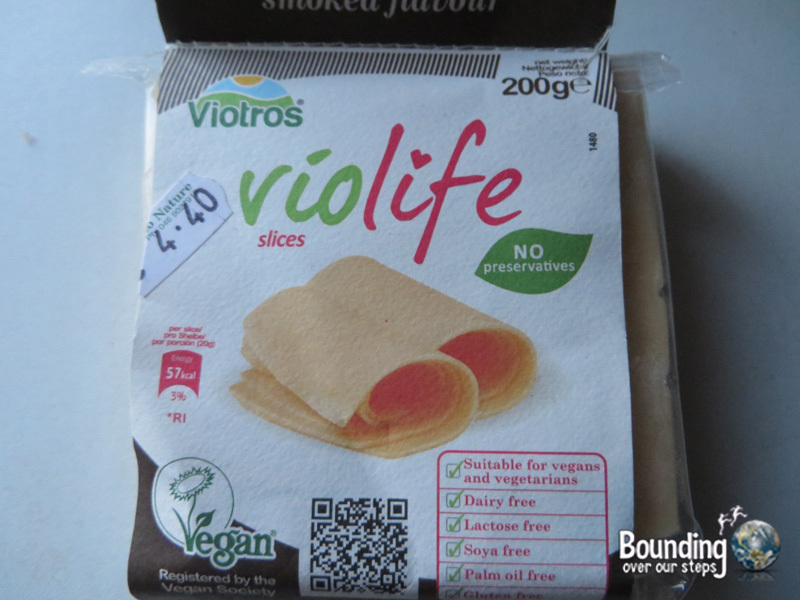 In fact, we discovered the best vegan cheese we have ever tasted: Violife! Their vegan cheese products are available in many countries worldwide, including Europe and South America, but unfortunately, it is not yet available in the USA. I have contacted the company, however, and they say they are working on it. I am keeping my fingers crossed and an eye out at the supermarkets! If you find yourself in Sligo town and are looking for Violife, or any vegan cheese for that matter, Tesco does not have it. After asking around and walking into several small stores, I was pleased to finally have found it at one of the most unlikely places – a meat shop! M Cosgrove and Son is 32 Market Street and Violife is in the back right corner of the store. For more information on specific vegan products and brands offered in Ireland, visit The Irish Vegan. 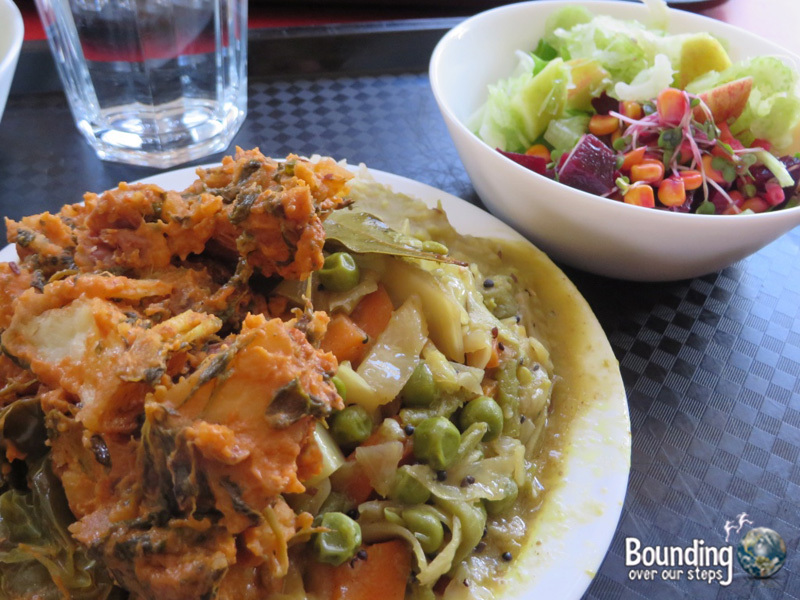 Located at 4 Aungier Street in downtown Dublin, Govindas is a vegetarian Indian restaurant with many vegan options. They have a buffet and you simply point to the dishes that you want. A small plate is 7.50 euros and large is 10.50 euros. They are very generous with their portions, so much so that we couldn’t even finish the small plate and had to get the rest to go. Although we found the food very flavorful, we left Govindas disappointed because we found them hypocritical by professing peaceful living and considering the cow sacred with one hand and quite literally serving ingredients, like cheese and yoghurt, that harm cows with the other. Located at 42 Drury Street, Blazing Salads offers both hot and cold meals and includes two salad bars, one of which is vegan. Vegan items are clearly marked, making it an easy place to get a good meal. There is only room for a few people to eat there, so most people order their food to go. We enjoyed the variety this restaurant had to offer. Umi Falafel is located at 13 Dame Street, very close to the Dublin Castle, and offers Middle Eastern cuisine, including falafels to die for. We confirmed that the falafels themselves are vegan as is the pita bread). 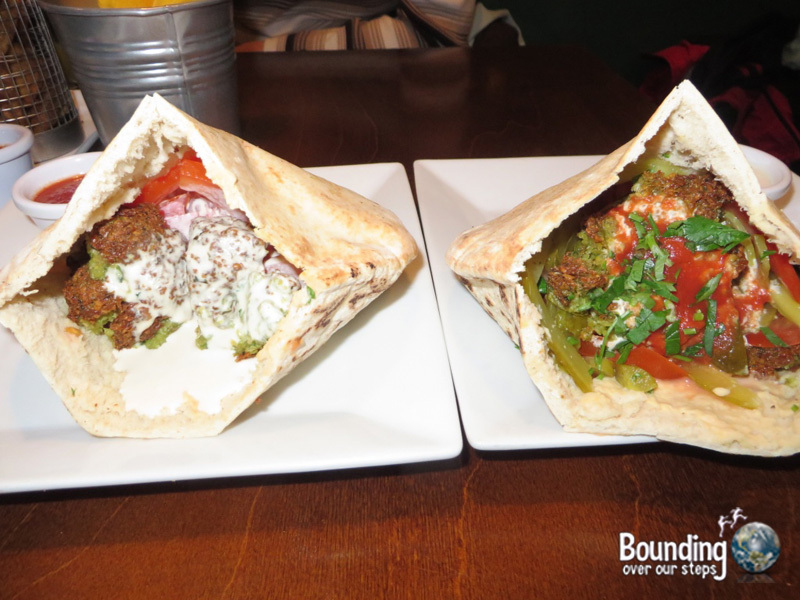 Do NOT leave Dublin without getting a falafel at Umi’s. Out of the various restaurants we tried in Dublin, we enjoyed Umi’s the most, so much in fact, that we decided to celebrate our 9th wedding anniversary there. In addition, Accents Coffee and Tea Lounge, which is located at 23 Stephan Street Lower, always offers a few vegan dessert options so if you’re in the mood for something sweet, be sure to stop in. Located on Bridge Street at the river, Sweet Beat is the closest thing to an all-vegan restaurant that we found anywhere in Ireland. With a strong focus on health, all their dishes were vegan with the exception of milk from cows that people could add in their coffee or tea and honey, that people could add in their smoothies. Sweet Beat’s menu changes every day and includes an array of salads, soups, wraps and stews as well as a smoothie and dessert menu. I ordered the Patatas Bravas and a Greens smoothie and was not disappointed. When visiting Sligo again, I would make it a point to stop in and enjoy a meal. In the small but vibrant surfing town of Strandhill in County Sligo there are opportunities to join The Vegan Surfer on one of his weekend vegan surf retreats. 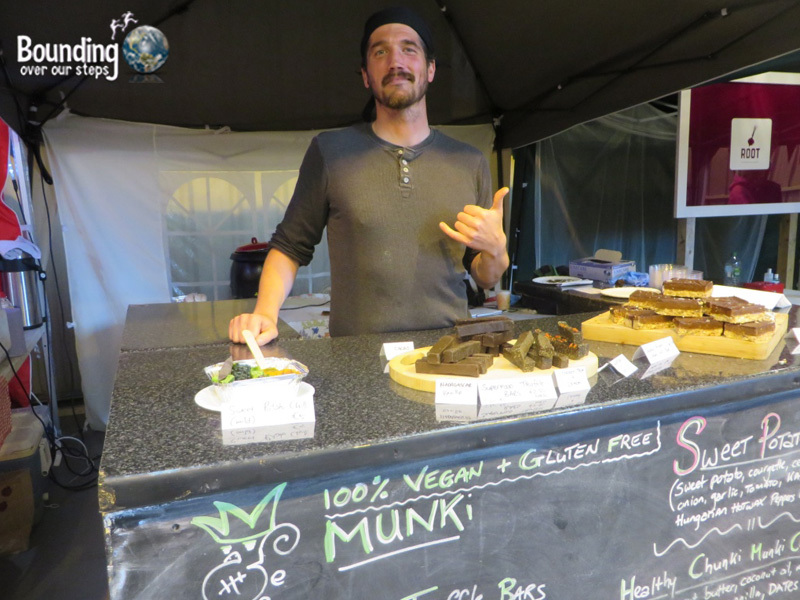 You can also often find him at the People’s Market on Sundays in Hanger 1 of the Sligo International Airport from 11am to 4pm, where he sells delicious vegan food, including both savory and sweet. In addition to his stand, there are also a couple of vegan desserts at another booth as well as vegan sushi and a vegan Indian dish. Some of these products might change from week to week so there is no guarantee that there will always be vegan options as some of the stands. But be sure to ask as they are not always marked, plus it’s good for vendors to know that the demand for vegan food is there and growing. The first sanctuary for farmed animals in Ireland, Eden Farmed Animal Sanctuary is a haven for animals that are widely considered food by society. With a strong emphasis on veganism and individuality Eden truly lived up to its name! We volunteered over a long weekend and were so impressed with Sandra Higgins, the founder and sanctuary director, and how well the residents of Eden are cared for and loved. We met Megan the hugging turkey, Breffni the exuberant chicken, Molly the shy but friendly goat and so many others. It was an experience that we will not soon forget! Be sure to check out their website and follow them on Facebook. Seal Rescue Ireland rehabilitates and releases injured seals, otters and birds. Their facility is located in Dublin and is open to visitors 365 days a year. While time did not permit me to visit their sanctuary, I was able to enjoy watching some of the seals they had released off of Culleenamore Beach just outside Strandhill in County Sligo. They joined the already existing colony there and can be seen enjoying the sandbank at low tide. I discovered several campaigns and animal rights demonstrations while in Ireland. Although my timing did not allow me to attend any of them, I was happy to follow their movements online. 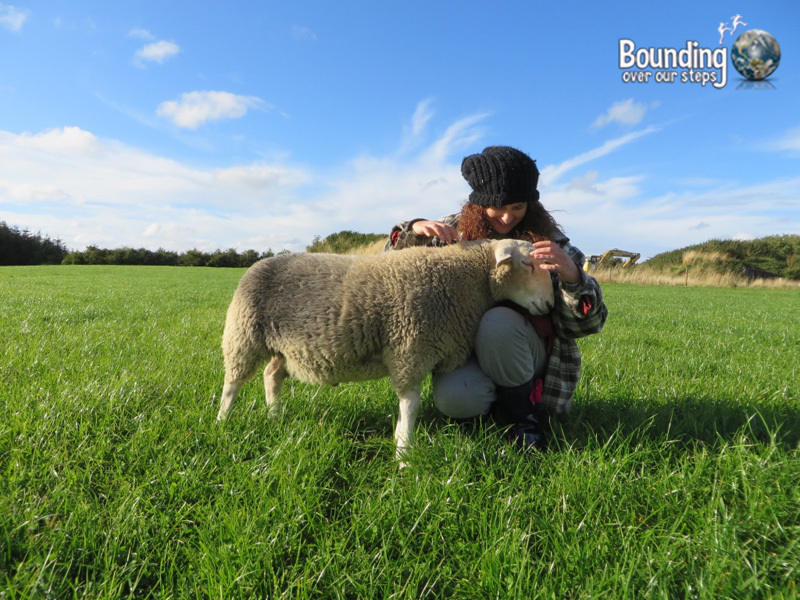 Lasting the entire month of November 2015, Eden Farmed Animal Sanctuary Ireland arranged a very effective abolitionist campaign encouraging people to go vegan. They put up pro-vegan posters on the sides of busses and at bus stops all around Dublin. These posters include the website govegan.ie which provides people with information about veganism and how and why to become vegan. It is the first campaign of its kind in all of Europe as far as I’m aware and it has received quite a bit of attention from individuals who have asked for more information to several media outlets who have interviewed Sandra Higgins, the organizer of the campaign. Animal Rights Action Network organizes rallies and demonstrations against animal abuse of various kinds. 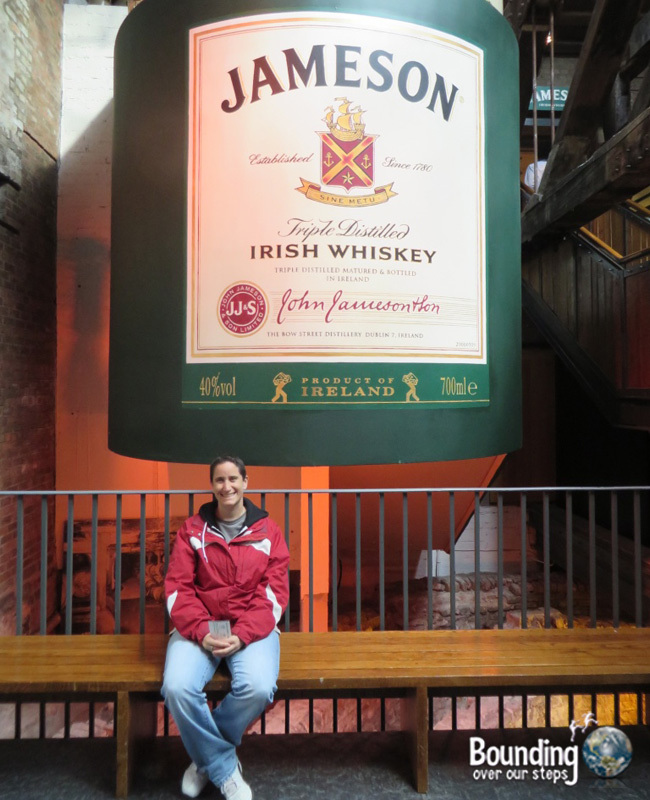 When planning a trip to Ireland, be sure to check out their calendar to see if you happen to be there for one of their events. The National Animal Rights Association is a vegan group that organizes ongoing campaigns targeting animal rights. They welcomed me to join them on any of their events, however the timing did not work out. Some of their campaigns include protesting the use of fur in clothing, protesting the capture of animals in front of the Dublin zoo and spreading the vegan message through leafletting in front of McDonalds. Be sure to check out their schedule on Facebook to learn of NARA’s upcoming events. Has being vegan held you back from traveling? 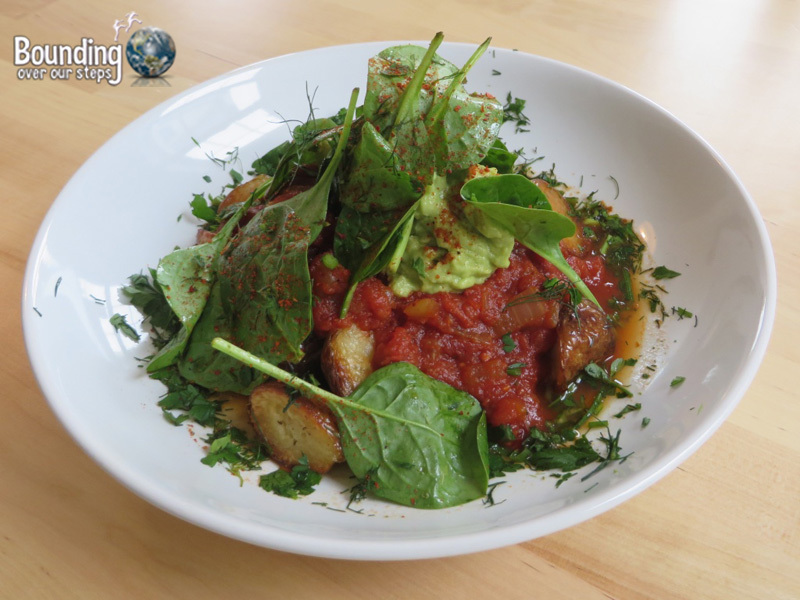 Are you concerned about not knowing how to find vegan option when in a foreign city or country? Consider buying The Essential Vegan Travel Guide by Caitlin Galer-Unti, which contains everything you need to know about traveling around the world as a vegan, including how to find vegan-friendly accommodations, what to pack and even how to make couscous in the hotel coffee maker! This post is part of a vegan blog tour compilation by Caitlin of The Vegan Word and author of the The Essential Vegan Travel Guide, now available in PDF and for Kindle. The previous stop on the tour was Toronto, Canada. Travel next to Vienna with Wendy at The Nomadic Vegan. Is Ireland on your travel bucket list? I want to try that cheese! And of course I’d love to visit the animal sanctuary! Great guide, you two! 🙂 Happy to hear that veganism is alive and well in Ireland. Looks like you ate well, and visiting the farmed animal sanctuary must have been a wonderful experience! I was rather surprised to hear there are no fully vegan restaurants in all of Ireland though. The movement is so strong in the UK, and I assumed it would be similar in Ireland. There is one. One! Sova Vegan butcher is the only vegan restaurant I know of in Ireland, it is a pop up restaurant at the moment however as they have not found a permanent place yet! Their food is to die for ? Cool! I haven’t been to Ireland since going vegan so I had no idea how easy/difficult it is there. That Violife cheese is expensive, though! I thought it was already expensive in Germany, but €4.40! Damn, Ireland must be an expensive place to live.